The North Carolina Arboretum provides children with the opportunity to enjoy a variety of unique experiences while they discover the wonders of nature in a safe, high-quality and enriching environment. Whether it’s hiking along Bent Creek or geocaching through the woods, the Arboretum offers an array of fun, educational and kid-friendly activities. Discovery Backpacks are available for loan for free at the information desk at the Baker Exhibit Center. These packs offer are themed to aid in exploration and include Trees, Insects, Reptiles and Amphibians, and Birds. Each pack includes tools and data sheets designed for children to observe, record and report their sightings in nature to real scientists. The Baker Exhibit Center is open from 9 a.m. to 5 p.m. daily. Families can pick up a TRACK Trail guide at the kiosk behind the Baker Exhibit Center and write down their encounters as they walk along the Arboretum’s Natural Garden Tail. Children will explore the Arboretum through the eyes of Shelly, the Arboretum’s resident eastern box turtle, and learn how turtles find food, water and shelter to survive. Families can log their sightings online to earn free prizes. Explore the Arboretum’s trails and find hidden treasures through geocaching. Visitors may pick up a geocaching packet at the information desk at the Baker Exhibit Center and kid-friendly geocaching GPS units are also available for loan for free at the information desk. Participants register and log their caches by creating a personal account on www.geocaching.com. 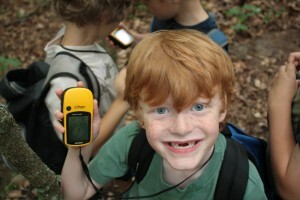 The Arboretum is currently home to 12 total geocaches under special permit by the U.S. Forest Service. The Baker Exhibit Center is open from 9 a.m. to 5 p.m. daily. 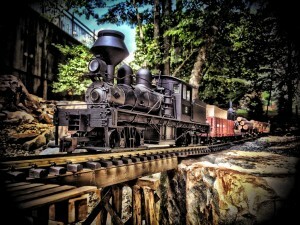 Featuring a G-scale (garden scale) model train, families will learn about the coming of the trains to Western North Carolina at the turn of the 20th century. Runs Saturdays and Sundays, from 12 noon – 4 p.m. (April – October). Visit the Arboretum’s Nature Discovery Room on the ground floor of the Education Center and observe live animals in realistic habitats. Test your powers of observation in the forest diorama and learn how to contribute your observations to real scientists. The Nature Discovery Room is open from 9 a.m. to 5 p.m. daily. The Arboretum’s popular guided field trip programs are offered Wednesdays, Thursdays and Fridays. The schedule opens in late August for field trips in September through May. Scheduling several months in advance is highly recommended. Please click here for more information. Looking for more activities and programs for your child? The Arboretum offers nature and science programs suited for all ages.